It’s not a good start for Lottery Magic UK. The web site is quite broken, with missing graphics and other problems. It looks unmaintained, except the page on horse racing tips gives a clue that someone has been there as recently as September 2009. (No I’m not sure why they are there either). If it’s still running they provide a Saturday Syndicate in the UK Lotto, and possibly play EuroMillions too. It costs £10 for the UK Lotto Saturday game to play for 13 weeks.Unfortunately whlst this may sound cheap, it’s not clear what you actually get for £10. It doesn’t say how many tickets are bought or how many people play in a group. So charges on playing are not clear. There are no charges on winnings however except a £1 admin fee on paying out. No. If it is still running it isn’t well looked after. And what you get for your money is just not explained. Website broken, costs not clear, may have ceased running? 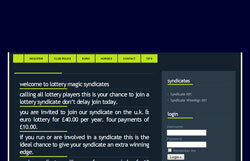 Lottery Magic UK has now closed down – give You Play We Play or Big Fat Lotto Syndicate a go instead.